So, the first line is the definition given in my lecture. The second line was given in a tutorial on the difference between DTFT and DFT. The first, obvious difference is the limit of the sum. While the first goes from -infinity to +infinity, the second treats a finite signal. I think DTFT are applied to infinite signals. Now, ,the second difference appears in the exponential function. In the second line, we are using small omega (2*pi*f) multiplied with n, which should be the sample index. In the first line we are using 2*pi*f divided by fs. I think the signal's highest frequency component divided by fs gives the number of samples. So... no, I still don't see the link to n. Can somebody please help me understand this? Although this question appears a lot in this forum? A DFT produces a finite number of results (frequency bins), so the complex result vector can be indexed by 0..(N-1). 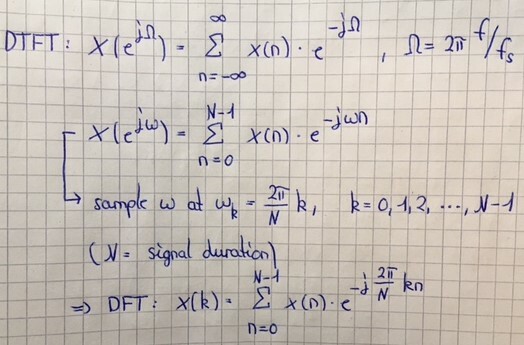 A DTFT produces a result over a continuous range of frequencies (more than a finite number of results) so must be specified by a real number as opposed to an integer. As MBaz says, you can sample the DTFT at a fixed integer number of points.